The Blue Economy is shaping a new ethical, more sustainable way to do business. Its creating jobs (millions of them), solving problems, teaching us to be more entrepreneurial and collaborative working with what we have, opening the door to innovation led by physics, inspired by nature - building on the green economy - but doing it in a systemic way, with new business models and innovation, where there is zero waste, and multiple benefits including building capital in all it's forms. Through a systemic approach, standing on the shoulders of the Green Economy, the Blue Economy provides us the principles, methodologies, business models and technologies to deliver win:win solutions to a changing economic landscape in which resource depletion and social costs are untenable and unsustainable. Its 100+ game changing innovations are set to generate 100 million new jobs in the next 10 years. These mostly disruptive and outcompeting models draw on the decennial works and the latest bodies of knowledge, research, experiments, and successful businesses of pioneering entrepreneurs, scientists and economists worldwide. So whether you are an entrepreneur, manufacturer, miner, farmer, government, NGO, business advisor, sustainability consultant, small business or a multinational company - you need to know about the Blue Economy to enable you to achieve your business goals in a way that reduces costs, builds resilience and generates value, whilst building capital in all it's forms. Join us for a thought provoking insight into NEW innovation that's creating jobs and building business and community resilience. View sustainability through a new set of lenses, see economic development in ways you could not have imagined possible and discover new business models and innovation that's reshaping how we do business in this one day Introduction to the Blue Economy Workshop lead by International Blue Economy Expert Anne-Maree Huxley. √	How to gain greater resource efficiency and achieve zero waste. 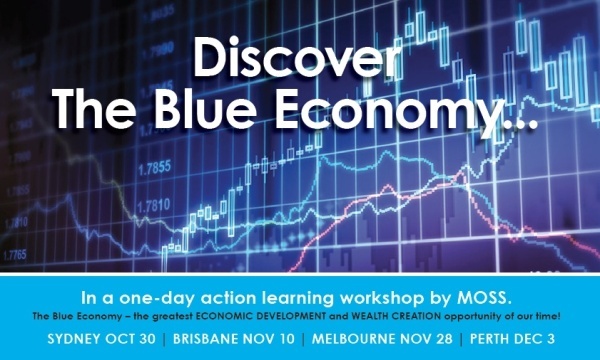 √ How to revolutionise your business and or industry through blue economy principles and innovation. √	How to innovate and work with what you already have to grow your business/industry. √	How blue economy innovation is creating jobs, generating economic development and building resilience. √	How to innovate and add value - future proofing your business. √	How to generate food security and new income streams from waste and have year round fruit and vegetables without the need for electricity. √	That working in business clusters, can help you innovate, cut costs and generate new income streams. √	How to problem solve through new innovation, business models and systems thinking. √	What the future holds for your business, industry and community and much much more! If you are responsible for or have an interest in innovation, sustainability, manufacturing, mining, agriculture, disaster management, economic development, education, R&D, entrepreneurship, business/industry and or advisory services - then take heed. This is for you! I promise you will be inspired - leaving with a new way to view economic development and new tools to support your journey! Price includes GST, morning and afternoon tea and a light lunch, plus points towards certification in a range of qualifications in the Blue Economy. Note: As attendance at this event will gain credit points towards a Blue Economy Certification, attendees must qualify for registration. A short questionnaire is included in the registration process. For full event details and program DOWNLOAD THE BROCHURE HERE. Einstein reminds us: "We can't solve our problems with the same thinking we used when we created them." We need a new set of lenses to view our challenges so we can devise holistic systemic solutions that work with not against nature to build capital in all its forms. The Blue Economy provides that lens. So don't delay, book today as numbers are strictly limited.